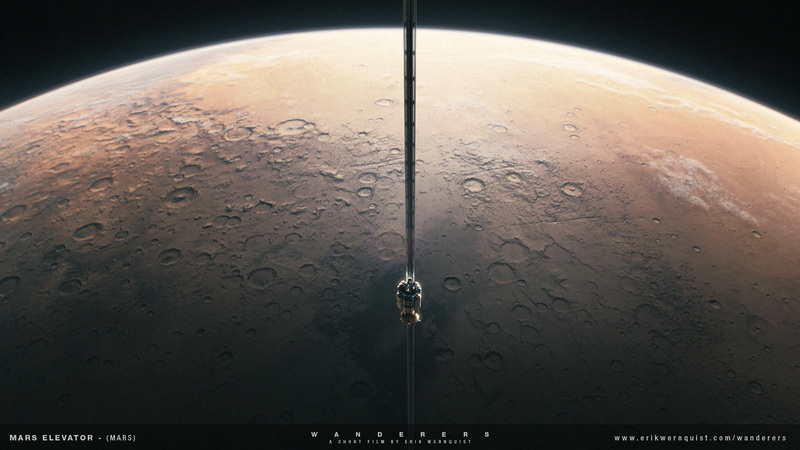 This shot follows the cabin of a space elevator descending on a cable towards the northern parts of the Terra Cimmeria highlands on Mars. A large settlement, hinted as glowing lights in the dark, can be seen far below on the ground. One of Mars' two moons - Phobos - is seen above the cabin to the left of the cable in the beginning of the shot. Although this concept is indeed a viable idea, it is also highly controversial when it comes to building one on Earth, and this may indeed turn out to be impossible due to the incredibly high demands on the strength of the cable in relation to its weight. On smaller, lighter worlds, however, like the Moon or on Mars, the prospects for a future space elevator are somewhat more promising. As Mars' diameter is about half of the Earths, the elevator cable wouldn't have to be as long to reach geostationary orbit and due to the lighter gravitational pull it wouldn't suffer as much stress from its weight.